The patient is a 21 year old female who presented with a left cervical lymphadenopathy. Fine-needle aspiration was performed on the lymph node. 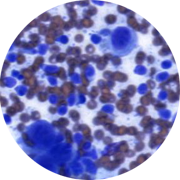 The aspirate smear revealed numerous Reed-Sternberg like cells and their variants ringed by lymphocytes. Sectioning of the lymph node biopsy demonstrated a mixed population of lymphocytes, occasional plasma cells, histiocytes, and easily recognizable Reed-Sternberg (RS) cells and variants. Immunohistochemical studies showed the RS cells are positive for CD15 and CD30, weakly positive for PAX 5, and negative for CD20. These findings are diagnostic of classical Hodgkin lymphoma, and most consistent with mixed cellularity subtype. Submitted by Ruobing Xiao, M.D.